I recently finished teaching The Adventures of Huckleberry Finn for what may be the last time. I might be transferred to the history department next year, and while I’m excited to teach a new subject and grow as an educator, I am going to miss teaching novels. The most wonderful part of being an English teacher is holding a book in your hand and knowing that it is your job to bring that novel to life. It feels good knowing your co-workers are people like Harper Lee and Mark Twain. I teach from the shoulders of giants. I will particularly miss my favorite co-worker, Huck Finn, a 13-year-old boy with distaste for becoming “sivilized.” Huck and I have a lot in common: accidentally offensive (Huck horrifies his foster parent when he tells her he’d rather go to hell if it means being with his friends, a sentiment I also espouse), earnest, funny and deeply conflicted as to what it means to be good. Huck is raised in the violent and racist antebellum South, taught from infancy that being a “low-down abolitionist” is a crime against God, and consistently criticized for not measuring up to society’s expectations of manliness (Huck climbs a tree, like a “coward,” to avoid being killed in a multigenerational feud). I try to be as brave as Huck. Like Huck, I’ve stood at the brink of disaster, torn “betwixt two things” and forced to decide “for-ever” which one I would choose. I’ve tried to pray and I can’t. Raised in a homophobic and benignly patriarchal religion, I’ve climbed a tree (wearing pants) to avoid being killed in the multigenerational feud between equality and sexism raging in my church. I’ve been called much worse than a coward for refusing to accept my role as a second-class citizen in the LDS faith. And if the people who love the outcast and oppressed go to hell, I want to go too, because that’s where my friends are. I can’t imagine enjoying a heaven without my gay, feminist, social-activist friends. I don’t want to be sivilized. I’ve sometimes longed to be like the “well-behaved Mormon women” who conform so perfectly to what our church expects of us. I listen to fiery sermons on “protecting the traditional family,” and like Huck, I’ve allowed myself to believe the messages that tell me I’m bad. Like Huck, I sometimes wonder why I have a conscience when all it does is “takes up more room than all the rest of a person’s insides, and yet ain’t no good, nohow.” I’ve been raised my whole life to listen to my conscience, this enormous thing inside me that tells me if God is “no respecter of persons,” I shouldn’t be either, and yet this conscience gets me in more trouble than I ever imagined. If Huck is a “low-down abolitionist,” I’m a “low-down feminist and LGBT ally,” and sometimes I internalize the message that this dooms me to Huck’s fate as an orphan and outcast. All Huck wants is the thing that Tom takes for granted: a family and a place in the community where he is accepted for who he is, not who he is supposed to be. I wish I didn’t have to choose betwixt being “respectable and well brung-up” and my devotion to Jim in his many modern incarnations. My students always think The Adventures of Huckleberry Finn has a happy ending. As it turns out, Jim’s been free all along, set free in the will of his master after she dies. Even better, Huck is offered the one thing he’s always wanted: a home with Tom’s relatives, where he will be raised with all the advantages he envies in Tom. But, true to his conscience, Huck makes a different choice. “I reckon I got to light out for the territory ahead of the rest, because Aunt Sally she’s going to adopt me and sivilize me, and I can’t stand it. 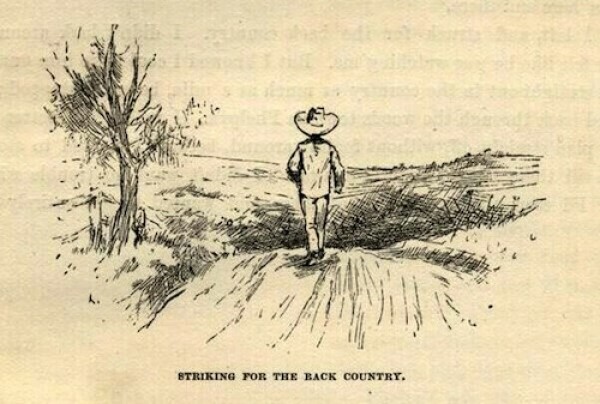 I been there before.” Huck leaves for the West because he’s “ahead of the rest.” His refusal to succumb to the racism and religious dogma of his culture puts him beyond his time, but it’s a lonely road to wander. But I’m also more like Tom than I dare to admit, raised with every advantage and often homesick for the privilege I’ve left behind. So every time I finish Huck Finn, I hope the territory out West is beautiful. I hope Huck strikes it rich panning for gold and going on adventures better than anything “sivilization” can offer. I hope it for Huck, and I hope it for me, too.